Chesterfield’s 2,000 years of history have twice seen the north Derbyshire town at the heart of revolutions which changed Britain and the world forever. A small inn in Chesterfield in 1688 was the meeting place for three local men who planned the overthrow of the Catholic King James II and his replacement by Protestant William of Orange. This “Glorious Revolution” – so-called because it produced little bloodshed – ended any chance of Catholicism being re-established in England and ushered in the Bill of Rights protecting free speech in Parliament. Now called Revolution House, the building where they met is now a museum. But it was Chesterfield’s role in the Industrial Revolution which shaped the town we see today. Railway pioneer George Stephenson, whose statue greets passengers alighting at the town’s station, made his home at Tapton, and is buried in Trinity Church. With its reserves of coal and proximity to the railways, the area became a hub for mining and engineering, and it was Chesterfield technology which built the machine that bored out the Channel Tunnel. Chesterfield began life as a community in the first century AD with a Roman fort or “caester” to the Anglo-Saxons who added “feld”, meaning grazing land. It received a royal charter for its market in 1204, and still has one of the largest outdoor stall markets in the UK. 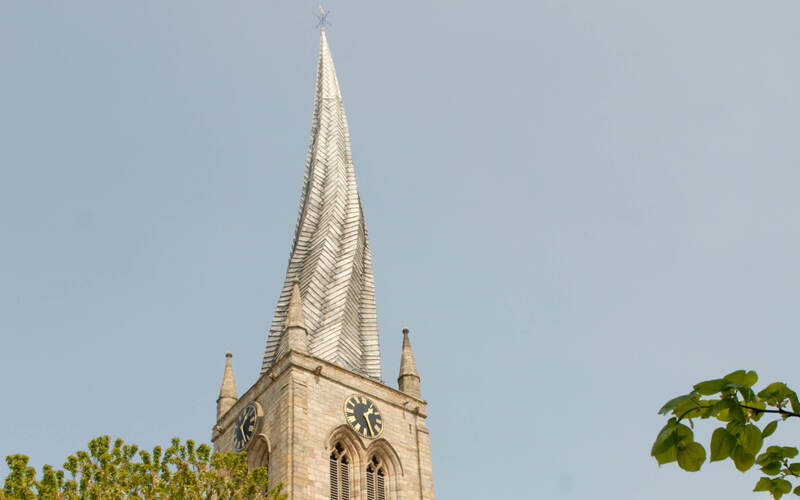 Its best known landmark is the crooked spire on the Parish Church, with explanations for its warped wooden frame ranging from the Devil swinging on it to a lack of experienced craftsmen in the wake of the Black Death. Fans of Chesterfield Football Club are called Spireites in its honour. The collapse of coal industry in the 1980s was a heavy blow to the town’s economy, but Chesterfield has kept its commitment to technology and manufacturing. It is now home to a number of leading organisations such as international drinks company Global Brands, Robinsons PLC, Bryan Donkin Valves and the Fusion Group, who specialise in the development and distribution of world leading technologies for the international utilities markets.